Diana Stralberg will be presenting her thesis defense seminar on Tuesday, November 3 at 1pm in the University of Alberta Biological Sciences Building room CW313. Check out her abstract below. 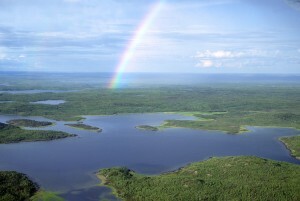 Photo by Craig Machtans, Environment Canada. 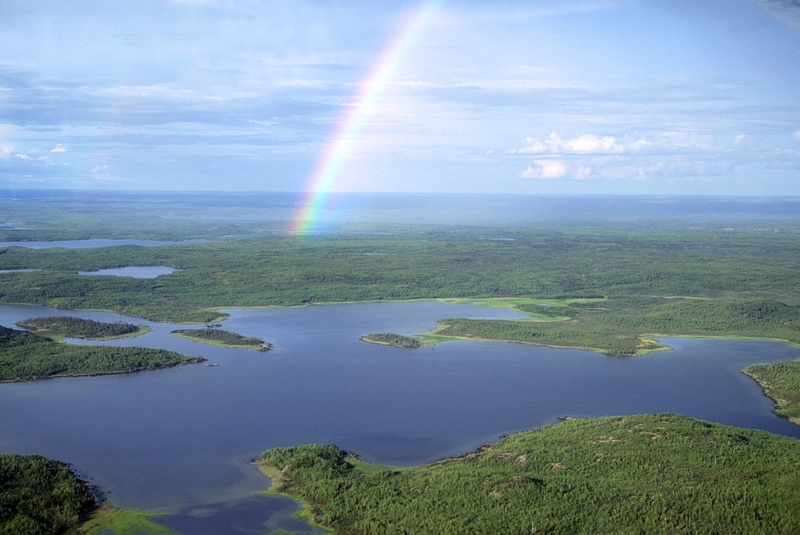 Abstract: Often referred to as North America’s bird nursery, the boreal forest biome provides a resource-rich environment for breeding birds, supporting high species diversity and bird numbers. These birds are likely to shift their distributions northward in response to rapid climate change over the next century, resulting in population- and community-level changes. Using a new continental-scale avian dataset, I have developed models to project climate-induced changes in the distribution and relative abundance of 80 boreal-breeding passerine species. For such projections to be useful, however, the magnitude of change must be understood relative to the magnitude of uncertainty in model predictions. In my first chapter, I found that the mean signal-to-noise ratio across species increased over time to 2.87 by the end of the 21st century, with the signal greater than the noise for 88% of species. I also found that, among sources of uncertainty evaluated, the choice of climate model was most important for 66% of species, sampling error for 29% of species, and variable selection for 5% of species. In addition, the range of projected changes and uncertainty characteristics across species differed markedly, suggesting the need for a variety of approaches to climate change adaptation. Species and ecosystems may be unable to keep pace with rapid climate change projected for the 21st century, however. In my second chapter, I evaluated an underexplored dimension of the mismatch between climate and biota: limitations to forest growth and succession affecting habitat suitability. I found that end-of-century projected changes in songbird distribution were reduced by up to 169% when vegetation lags were considered, indicating that limits to forest growth and succession may result in dramatic reductions in suitable habitat for many species over the next century. I used these results to identify conservative and efficient boreal conservation priorities anchored around climatic macrorefugia that are robust to century-long climate change and complement the current protected areas network. Vegetation change may also be delayed in the absence of disturbance catalysts. In the western boreal region, a combined increase in wildfires and human activities may aid these transitions, also resulting in a younger forest. In my third chapter, I developed a hybrid modelling approach based on topo-edaphically constrained projections of climate-driven vegetation change potential, coupled with weather- and fuel-based simulations of future wildfires, and projections of large-scale industrial development activities, to better understand factors influencing decadal-scale upland vegetation change. I simulated scenarios of change in forest composition and structure over the next century, conservatively concluding that at least one-third of Alberta’s upland mixedwood and conifer forest is likely to be replaced by deciduous woodland and grassland by 2090, with a disproportionate loss of both young and old forest classes. During this timeframe, the rate of increase in fire probability diminished, suggesting a negative feedback process by which a warmer climate and more extensive near-term fires leads to an increase in deciduous forest that in turn, due to its relatively low flammability, leads to a long-term reduction in area burned. Finally, boreal species’ projected range shifts could be impeded by the northwestern cordillera, which separates boreal Alaska from the rest of the North American boreal region, and appears to have historically prevented many species from expanding into climatically suitable habitat after the last glacial maximum (LGM). Using paleoclimate simulations for the past 20,000 years, I analyzed the relative importance of migratory and life-history characteristics vs. climatic factors on the distributions of North American boreal-breeding species. I then used this information to predict which species are most likely to shift their distributions from Canada into the Alaskan boreal region in the future. The high relative importance of climatic suitability within the northwestern cordilleran region suggests a capacity for several species to disperse into Alaska once climatic connectivity is achieved in the future, which is supported by recently recorded signs of breeding activity. This entry was posted in birds, conservation, research, science, seminar, thesis defence, university by jahaines. Bookmark the permalink.